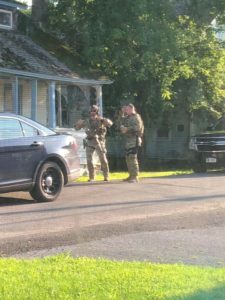 An eight-hour standoff came to an end just before midnight Thursday night with police taking a 51-year-old Whitehall man into custody. Whitehall Sgt. Ryan Pedone (right) confers with a New York State Police SORT trooper. The incident began at 4 p.m. on July 26 when Whitehall police received a report of a domestic dispute at 28 Montcalm Ave., trailer four. Police said Joseph P. Gordon allegedly made threats to harm others, brandishing a rifle in the process. “He ended up having a domestic at the residence and ended up pointing a rifle at the victim’s daughter,” said Whitehall Sgt. Ryan Pedone. When police arrived at the residence, they found that Gordon had barricaded himself inside, prepared for a fight with police. “He referenced that he was ‘locked and loaded’ and ‘to bring them on,’” Pedone said. It was at this time that Whitehall police requested assistance from other law enforcement agencies including New York State Police and their Special Operations Response Team (SORT), Washington County Sheriff’s Office, state Department of Environmental Conservation police as well as Skenesborough EMS.